After an absence of 90 years, the ancient institution of the caliphate roared back into existence on the first day of Ramadan in the year 1435 of the Hegira, equivalent to June 29, 2014. This astonishing revival symbolically culminates the Islamist surge that began forty years ago. A Western analogy might be declaring the restoration of the Hapsburg Empire, which traced its legitimacy to ancient Rome. For starters, a quick review of the caliphate (from the Arabic khilafa, meaning "succession"): according to canonical Muslim history, it originated in 632 CE, on the death of the Islamic prophet Muhammad, then spontaneously developed, filling the nascent Muslim community's need for a temporal leader. The caliph became Muhammad's non-prophetic heir. After the first four caliphs, the office became dynastic. From the start, followers disagreed whether the caliph should be the most able and pious Muslim or the closest relative of Muhammad; the resulting division came to define the Sunni and Shi'i branches of Islam, respectively, causing the profound schism that still endures. A single caliphate ruled all the Muslim lands until 750; but then two processes combined to diminish its power. First, remote provinces began to break away, with some – such as Spain – even creating rival caliphates. Second, the institution itself decayed and was taken over by slave soldiers and tribal conquerors, so that the original line of caliphs effectively ruled only until about 940. Other dynasties then adopted the title as a perquisite of political power. The institution continued in an enfeebled form for a millennium until, in a dramatic act of repudiation, modern Turkey's founder, Kemal Atatürk, terminated its last vestiges in 1924. Despite several subsequent attempts to restore it, the institution became defunct, a symbol of the disarray in Muslim-majority countries and a yearned-for goal among Islamists. 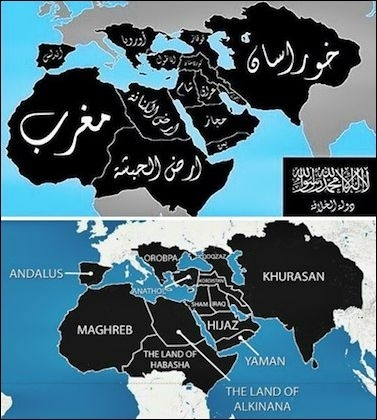 Top: The world as ISIS sees it, using medieval Arabic place names. Bottom: The same map in Roman lettering. And so matters remained for 90 years, until the group known as the Islamic State in Iraq and Syria (ISIS) issued a declaration in five languages (English version: This Is the Promise of Allah) proclaiming the founding of a new caliphate under "Caliph" Ibrahim. 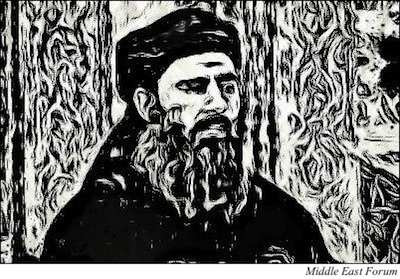 Caliph Ibrahim (aka Dr. Ibrahim Awwad Ibrahim), about 40, hailing from Samarra, Iraq, fought in Afghanistan and then Iraq. He now claims to be leader of "Muslims everywhere" and demands their oath of allegiance. All other Muslim governments have lost legitimacy, he claims. Further, Muslims must throw out "democracy, secularism, nationalism, as well as all the other garbage and ideas from the West." Reviving the universal caliphate means, announces The Promise of Allah, that the "long slumber in the darkness of neglect" has ended. "The sun of jihad has risen. The glad tidings of good are shining. Triumph looms on the horizon." Infidels are justifiably terrified for, as both "east and west" submit, Muslims will "own the earth." I predict that the Islamic State, confronted with hostility both from neighbors and its subject population, will not last long. It will leave a legacy, though. No matter how calamitous the fate of Caliph Ibrahim and his grim crew, they have successfully resurrected a central institution of Islam, making the caliphate again a vibrant reality. Islamists around the world will treasure its moment of brutal glory and be inspired by it.